New Mailer is really Cookin’! Zoeadventurebear1052 is lovin’ her new oven that she got from a code in the latest Build-a-Bear mailer! Keep an eye on your mailbox for this pamphlet, which describes the new Rudolph and Clarisse set of animals that will be coming out for Christmas, and includes a store coupon! Free Halloween Emoticon Available At Build A Bear Workshop This Weekend! Celebrate Build-A-Bear Workshop’s birthday! Buy one CeleBEARation bear and get one FREE! Use promo code 95383 online through Oct. 27! New Limited Edition Zoo Friends Available at Build-A-Bear! Thank you to member kathleenjuly8 for mentioning the new exclusive Limited Edition Zoo Friends that are now available at Build-A-Bear.com! There is a new Red Panda, Puffin and Poison Dart Frog now available for purchase for $16-18 USD depending on which animal you purchase. There is still plenty of time left in October to track down Maxine in order to obtain her cool gift this month! It’s a trick’o'treating emote! Thanks to BettyBeachBear7 for sharing this info with us. Build A Bear Explorer Pack Available at Embassy Suites! Build a Bear has teamed up with the Embassy Suites chain of hotels to offer an exclusive explorer package! The package is available for purchase as an addition to any stay at the Embassy Suites and includes the following items: Bear-sized explorer hat, vest, pants, binoculars, canteen, butterfly catcher, passport, messenger bag and a $5 off coupon valid at any participating Build A Bear Workshop store! The Embassy Suites website also contains an fun little online Build A Bear game as well! Thank you to AbbygailBearDiva59 for making us aware of this unique promotion! More details can be found HERE on the Embassy Suites website! 2010 Winter Build A Bear Animal Now Available – Snow Hugs Teddy! Enter the Bearville Insider Bippity-Boppity-BOO! Contest to Win a Ghost! Check out Tamster’s new Bearville Insider Bippity-Boppity-BOO! Contest to celebrate the upcoming Halloween season. You could win a ghost, virtual bear or a raking move! For more details, visit this thread in the contest section of the forum! Don’t Forget to Read the New Bearville Times! Thank you to Moonbow for reminding us all the read the new Bearville Times. If you read it all the way through, you will be awarded a new Pin Lamp as shown below! 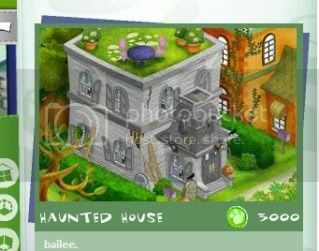 Haunted Houses Come to Bearville! Next time you are at the Lumbearyard, be sure to check out the new Haunted House exterior available now! It can be located in the exterior section on the second page and it costs 3000 bear bills to purchase if you’d like to add it to your Cub Condo. Thanks to member B A B V for letting us know about this awesome Halloween feature!